Did you know that Chipper Jones of the Atlanta Braves has been a huge supporter of the Cystic Fibrosis Foundation? He has donated over 1,000,000 to the CFF since his rookie year of play. That is pretty awesome people! As a thank you, the GA chapter of the CFF is putting together a slide show and photo album to present to Chipper as a thank you for his support over the years. We, along with our fellow CF families across GA were asked to send in a picture of our CFer. 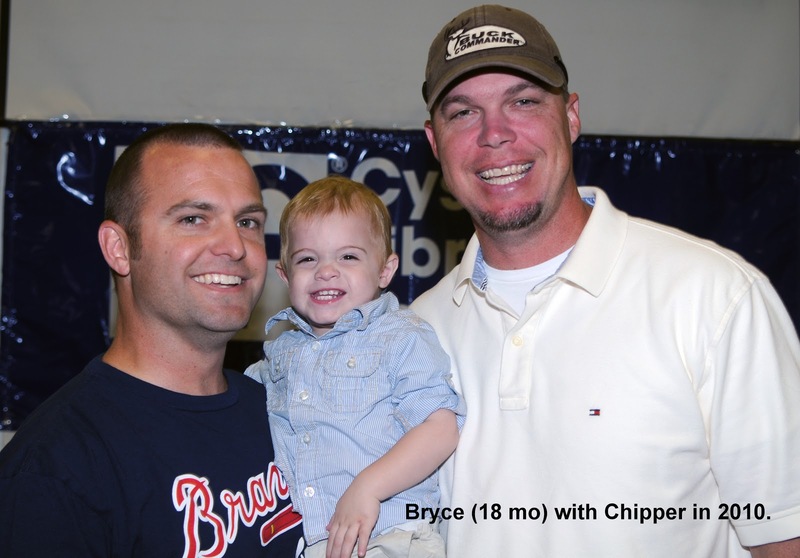 Since Bryce has had his photo taken with Chipper a few times when he was younger I decided to send those pictures in along with 2 current photos. Hopefully Chipper will remember Bryce and hopefully he will get a good laugh out of Bryce's current photos. **A couple of years back Bryan's school participated in the Cure Finders fundraiser at the school he teaches at - Davis Elementary. The kids ended up raising the most funds out of all the schools in 2009 and 2010, which won them a visit from Chipper each year! and for some really good Braves baseball!